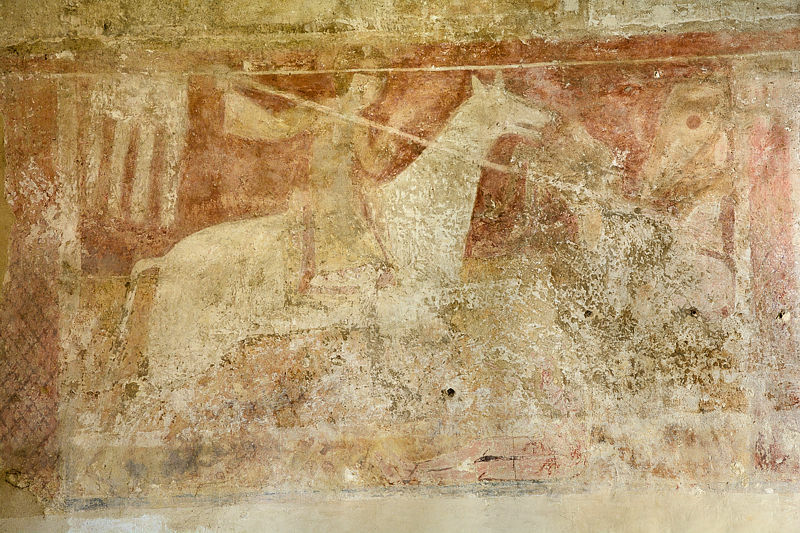 Possibly the earliest depiction of St George in England is in the wall paintings at St Botolph’s Church, Hardham in West Sussex which date from the 12th century. Unusually, these paintings don’t show St George and the Dragon, (unless it was once in the space now taken up by the later window in the east wall of the nave). Those that do exist are of St George at the Battle of Antioch, St George before Datian (Diocletian) and St George on the Wheel. St George before Datian is now partly obscured by the more recent doorway, but the other two murals remain clear. St George at the Battle of Antioch is the first of the lower tier of paintings on the north nave wall. The saint is shown mounted upon a large white horse which he is reining in with his left hand, while with the right he has impaled a knight with his lance. There are traces of a group of armed figures at which the saint is riding, but unfortunately this part of the painting is very obscure. The lance bears at the reverse end a white four-tailed pennon, similar to those in the Bayeux Tapestry. 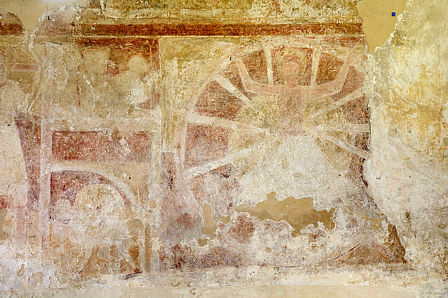 The other panel depicts the martyrdom of St George on the Wheel. His halo is more visible here than in the ‘Antioch’ panel. The legend relates how that, after enduring other cruel tortures for eight days the saint was bound to a wheel of swords but the wheel was broken by two angels who descended from heaven. George was executed by decapitation before Nicodemia’s city wall, on 23 April 303. A full 360° panorama tour of the interior of the church showing all of the murals can be seen here. This entry was posted on Saturday, April 23rd, 2016 at 11:48 am and is filed under Art, History, Panorama. You can follow any responses to this entry through the RSS 2.0 feed. Both comments and pings are currently closed.